Thanx for the effort! The first 5D is still a great camera with unmatched T-Stops and lowlight abilities... so this is definately an interesting step for some of us. Is there any Beta-Firmware available for testing or can we just use the normal trumk (for 60D etc.)? i have a necessary to do a time lapse, or do the movie with my canon 5d classic, if must possible which firmware downloaded, and where? I could release an autoexec.bin (or feel free to compile it yourself from the sources! www.bitbucket.org/hudson/magic-lantern), but not much works yet. Until I finish up fixing the properties, there won't be much to test yet. I fixed the gui_state property a few days ago and that made the intervalometer work, so now I just need to narrow down which properties work and which don't. The thing bothering me right now is the aperture property (doesn't seem to work right), shutter speed and ISO properties are working so that can be changed from the menu. Question: should I keep picture styles in the ML menu or hide it since it probably won't provide much more functionality? More or less convenience. So, any suggestions for what to leave / what to remove for the 5dc would help. What I understood (and could also be totally wrong...) is that the camera is like a computer and in the firmware (not sure, maybe it's in the camera and the firmware is just additional programs) there is an OperatingSystem in it (DryOs), that is used by ML. If in the OS there isn't the software that make what you say ML can't use/do it. For example 3x zoom in 600D is not portable to other camera because it is only in the 600D firmware. This means that canon could in theory add LV to 5Dc OS but then are you sure that it's CPU is fast enough to show you a fluid LiveView? I can save .422 file that are 3 times bigger than 320x240 so it's more cpu intensive. Since we don't know all the hardware specs, this approach is safer because ML use what canon already coded and tested (with the full specs at hand). for the shutter count I'll believe yes. But the fact that canon can check the shutter count at its service centers tells me that there is a property recording it somewhere. I had to hijack a state object (EMState) to see when the shutter was pressed. This is because for whatever reason, only an event for halfshutter unpress is sent by the GUI task. So I had to improvise. Next I need to find focus confirmation, that will make Trap Focus work. For HDR / bulb timer I need to find a way to trigger full press of the shutter (PROP_REMOTE_SW2 isn't in the 5dc). For custom AF patterns I need to find the property for the focus points. For the Shuttercountvalue-Topic: Wouldn't it be possible to dump the whole memory, make a picture, dump again and compare both dumped images? There should be one register altered, but this is just one guess. the property region of memory can't be observed, it just dumps an empty file. I've found anything past 0x1000000 is invisible to dumps (memory layout is different than dryos). 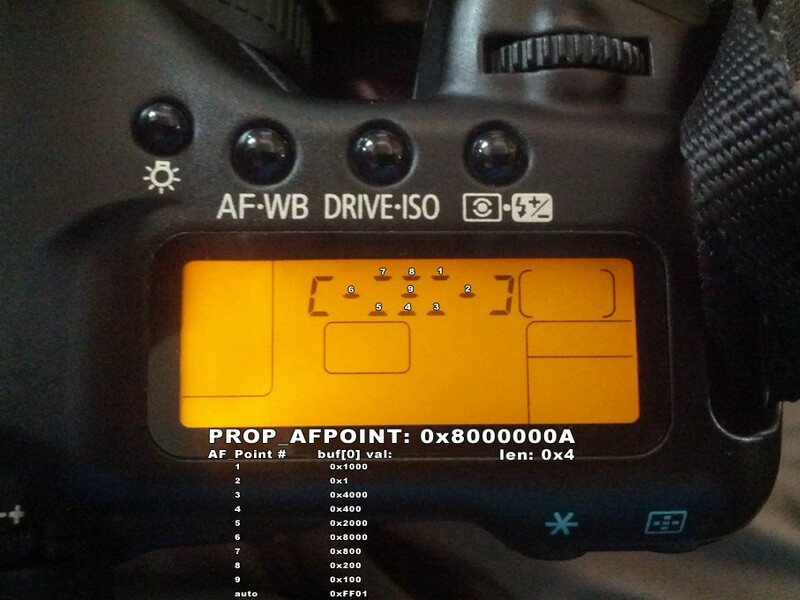 In 400plus they just use a simple pointer in memory to read the shutter value. I could try that, but I don't have something to diff the 2 dumps. Anybody want to write up a python script? Can you get the shutter count by printing out ioGlobalStdset? Didn't seem to print anything to that file, interesting. I know there are some printf statements in the ROM, are we using the right arguments for this? All tasks will use this new assignment when doing I/O to stdFd, unless they have specified a task-specific standard file descriptor (see ioTaskStdSet( )). Good news: custom AF points may work for 5dc! Property seems to be the same from DryOS. Can anyone verify if the values are the same? I wonder if trap focus will work when I have AF under AE lock button (under thumb), half shutter I have AE lock? It is Custom Function -> position "04" value "1"
I still need to find a status pointer that indicates focus confirmation, but yes I believe it should still work regardless of that CFn value. The hunt continues for shutter actuation counter too, searched about 1000 properties yesterday with no luck. HDR bracketing works now, but I need to find PROP_LENS to determine min/max aperture that ML can use. That will fix aperture setting. As it stands, intervalometer and hdr bracketing are the only 2 features that work. And some disappointing news for focus patterns, I couldn't set any custom focus patterns using the property. Not sure if it's going to be possible now. It just reverted to 0 every time I set something (selecting no AF points). Weird. this is great work in progress. I only registered to encourage you. I have the 5D classic and love it. The only thing I wish would be an AutoISO function in P/Av/Tv mode (even if it is only between ISO 100 and 400), but of course, anything would be great. I keep my fingers crossed that you manage soon. All the nifty things sounds cool, but will it add AF microadjustment? Hi, awesome work you are doing with the 5DC. I am trialing ML on my 500D at work and its been great! I'd love to start time lapsing on the 5DC is it possible to just use this feature? Or shall I just bite the bullet and get a hardware intervalometer? I am going on holiday in 2 weeks and I'd like to do some time lapsing while I'm away. I haven't released an autoexec.bin yet just because there is so much to fix yet. I am close though, don't worry. unfortunately no 5dc is far too old for this feature. This may be possible, but first I need to work on getting ML running stable on the camera. Auto ISO would be awesome! Let me know when I can be of any help. Beta 1 is available for download. Please check the first post of this thread for details. I just tried it, my 5DC is half dead when I make my CF bootable for ML. The all buttons located at the back of the camera does now work (no reaction from LCD nor camera) + the shutter button can focus but won't snap a shot. Pressing the "Trash" button does not display the ML menu. I followed the instructions on how to install ML + 5DC hack. At first I got a steady blue light and when ML won't work for me I updated the Mod firmware twice to disable then enable bootflag. Same result as before (Half dead state). Oh and my 5DC still works normally, just couldn't get (beta) ML to run. Sorry about that, this is confirmed an issue now due to the link I had up for making the card bootable. Tomorrow I will make the installer write the bootflags to the cf card (like ML does for other cameras). Just to clarify, your camera was not bricked there. It is only a "soft brick", pulling the battery and putting a good card in fixes this. I guess the mac program to make bootable cards doesn't write the correct flags. I have updated the installer FIR included with the download in the original post. It now calls the bootloader function responsible for setting the card bootflags. So, users will not need to worry about making their cards bootable now. Still not sure why this isn't working on some cameras, I need more testers to try and report how it works.